#MotivationalMonday #MarathonMonday Free Oxygen & Running Battlefield. Posted in #marathonmonday, #nuunlove, balance, big book of marathon training, Boston, bq, confidence, disappontment, discipline, excitement, excuses, long distance running, long run, marathon, marathon monday, Marathon training, Monday motivation, Mondays, Motivation, motivation Monday, motivational Monday, muscle recovery, NUUN, wind	by Jess@Run Pink! I wanted to run an easy six yesterday but I had to work ALL day. On Easter. I know. (So over pharmacy. Working hard everyday towards becoming a full time personal trainer!) So long run on Saturday plus being on my feet all day Sunday I just felt so sore all over especially my feet. So my hubby and I went on a short hike post work. And after all that hydration talk on Friday, I still have felt dehydrated all week. Why? So where’s the motivational part of this post, miss negative Nancy?? I thought I would share with you all where some of the money goes when you donate to St. Jude. So regardless of how perfect or less than stellar my training goes during this marathon season, I know I’m running for a greater cause. If only 22 people donated just $20 dollars one kid could have one day of oxygen. I have free oxygen everyday. My body doesn’t fail me in health. It may become weary and tired at times…like during marathon training…but it is in good health. If you are blessed with free oxygen would you consider giving any amount to these kids? Donate HERE. I’m betting I’ll add another rest day in on Sunday. So that total mileage will be lower, like this past week. But I’m okay with this. Overall I’ve had a pretty solid training season. Rest is a key element in training. And I’ve almost lost sight of this. I’m so grateful that all the monster long runs are behind me. We begin the slow taper. How’s your training going? Doubts? Fears? Excitements? Do you compare yourself to other runners occasionally? Posted in excuses, quotes, Runner's journal, running log	by Jess@Run Pink! Ah ha! It worked! Knowing I had to (refer to last Monday’s post) take a picture to show proof I filled up my running journal with runs and XT gave me a swift kick in the bootay to get my week on! Okay so I was supposed to show proof Sunday but whatever….what’s a day right? It was much easier last week because I was on my little staycation (away from work thank you Jesus!) But now it’s back to the grind….boooooooo!!! Anyway, on another note…. I really like my Runner’s Journal. It’s technically called, The Complete Runner’s Day-By-Day Log 2012 Calendar by Marty Jerome. It has all the calendar space I need and includes tips and quotes that help encourage me each week. The quote in the picture is one from the Running Calendar, one I love the most! Posted in excuses, monday	by Jess@Run Pink! Last week went by way too fast! It was a busy week full of work and the kid’s swim! Thursday the kid had swim meet #3. And it was out of town by about 1 hour and 45 minutes away. And the meets are generally very long. Say about 3-4 freaking hours long!! We didn’t get home till 12:45 that evening. I’m no night owl. I like my sleep. I swear I’m an 80 year old woman in a 26 year old body. But next morning guess who had to be at work at 8 am??? I made it by 8:02. I know, I know. I’m a total slacker. 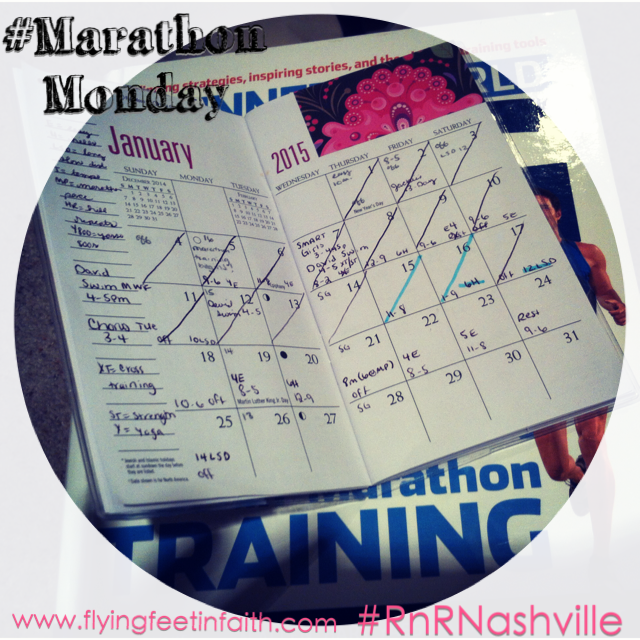 I say all this mess to say that last week’s MT(marathon training)W(week)#2 did not go exactly as planned. Oh, I did get three solid runs in (minus one mile on the long run…gaaaah) but forget about any other form of excersice. I did manage to get a few push-ups, crunches and yoga poses in but I guarantee nothing noteworthy. And here I am. Blogging. Not moving. It’s only Monday. Wednesday: I get my hair cut! Yay. Okay so I guess the week isn’t too full…but as a mother it can be so easy to say, “I just don’t have time to get my workouts in”. Yes YOU do!!! •Starting everyday off with prayer is a huge help. •Keep a runner’s or fitness journal. •Write down a schedule!! Everything from wake-up time, laundry, runs, playtime, tv time <–shouldn't be too much if any of this!, shower time, phone calls, Blogging, whatever. And try to stick with it. •Get shut eye! Easier said than done. Especially for mothers! Try to set a certain time for yourself to be in bed. So if you know you’d like to be up by say 6:30 get to be no later than10:30 for 8 hours of sleep….okay so I may be in fantasy land now but it is a nice idea. •Get organized!!!!! Knowing where things are is a huge time saver! I have a small area of my home where I keep all my workout gear like magazines, yoga mat, dvds, ect. •Lay your workout, running clothes and/or shoes out the night before where you will see them first thing in the morning. •Or just sleep in your workout clothes. Me? I prefer pjs. But whatever works for you and gets you going! •Make workout time fun with the kid(s). Say you don’t get up in time to get it in before the madness of the day starts, get your kid in the action!! Get out the jump-ropes, try fun yoga poses together, take a bike ride. •There WILL be days and weeks that do not go as planned. Just know that it is OK. Life will go on and so will your training plan. •Just keep on keeping on!!! Here is a picture of my blank planning calendar for the week. By Sunday I will post a picture of it FULL. That’s the plan!